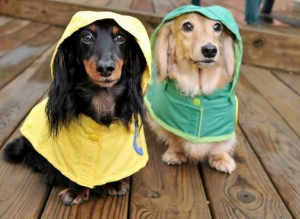 Prepare Your Pets as Hurricane Season Approaches! You are at:Home»Disaster & Emergency Preparedness»Prepare Your Pets as Hurricane Season Approaches! Wake Forest, NC – May 25, 2016 – Hurricane season is now upon us – running from June 1 – November 30. It is expected to be a busy hurricane season this year. A total of 12 named storms, five hurricanes and two major hurricanes are expected this season. It is not realistic to think certain areas cannot be affected by a hurricane. The entire Atlantic and Gulf coasts are considered high-risk areas. Inland areas are affected by the high winds, floods and tornadoes. The best protection from a hurricane is to be prepared and have a plan. These plans should include the entire family – that means our pets. To help pet parents prepare for hurricane season, TripsWithPets.com provides an online Disaster Preparedness and Resource Guide for Pets. Pets are abandoned during hurricanes and natural disasters every year. Pet parents’ lack of planning is a big part of the problem. Many find themselves scrambling to find a safe harbor for their pet in the event of evacuation from their homes. The most important part of a disaster plan is to prepare for an evacuation. Red Cross disaster shelters cannot accept pets because of states’ health and safety regulations and other considerations. Further, most kennels, veterinarians, and animal shelters are usually filled beyond capacity. TripsWithPets.com’s Disaster Preparedness and Resource Guide for Pets offers a pet evacuation plan checklist, complete with resources on finding a safe place for pets to stay, what to do if pets are home alone when disaster strikes, as well as recommended items to include in a Pet Evacuation & Disaster Kit. The guide also offers resources such as; direct access to the National Hurricane Center, Weather Channel, American Red Cross, and FEMA. In addition, pet parents will be able to directly book pet friendly accommodations in the event of an evacuation. To keep pets safe, create a disaster plan now. Learn more at: https://www.tripswithpets.com/disaster-preparedness-guide-for-pets.